It’s been a busy silly season for the NASCAR Whelen Modified Tour. Not only have several drivers switched rides, but several top drivers have shuffled between top shelf teams. There are four A-list drivers with new homes for 2005 and any of that class - Eric Beers, Doug Coby, Chuck Hossfeld or Jerry Marquis are more than capable of winning the Tour championship this year. And the start of 2004 was good for Hossfeld. He finished third in the season opening Icebreaker and led over 100 laps early on at Stafford in the second race of the year, but then the bottom fell out. Problems dropped him back in the finishing order at Stafford, where he ended up one lap down in the 12th position and finishes outside the top ten in the next four races put Hossfeld and his #4 Bob Garborino-owned team seriously behind in the battle for the points lead. A victory at Seekonk and a seventh-place finish in points helped to salvage the season somewhat, but the end result was not what Hossfeld or Garborino had hoped for and they parted ways in the off-season. Replacing Hossfeld in the #4 is Jerry Marquis, who didn’t have a shabby 2004 himself. While driving the Boehler Ole’ Blue #3 car, Marquis won at Stafford and Riverhead. He finished third in points, but was not quite in the championship picture come the final race of the year. But there are two guys on the list who have been there before. Chuck Hossfeld’s new home for the year is the Don Barker-owned #50 team and there is a little bit of history between the team and their new driver. Two years ago, this was the #50 team that won the Modified championship with Todd Szegedy sitting behind the wheel. Only 32 points back was Hossfeld. With Szegedy taking on a limited Busch Series schedule last year, Hossfeld looked like the obvious choice for the title. He was ranked as the pre-season favorite in NASCAR’s poll of media members and expectations were high. Both drivers are happy with their new surroundings and can’t wait for the year to get started. “I’ll tell you, I am really excited for the season to begin,” said Hossfeld. The seat in the #4 belonged to Hossfeld last season and will be taken over by Jerry Marquis this year. 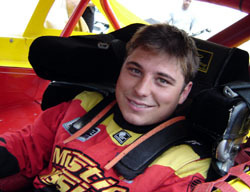 Thompson aboard the #4 car in 2003 and Marquis is aware of the history that his new team has in that event. And both drivers think that they can settle into their new seats quickly and be in the championship picture come October. But getting too concerned about the points is something that these veterans know can put you behind, rather than ahead. There are a few experiences from 2004 that will help both Hossfeld and Marquis adapt quickly to their new surroundings. Hossfeld started out the season driving the #47 SK Modified at Stafford on Friday nights and was instantly a contender despite getting used to a new type of racecar. Meanwhile, Marquis already knows his new crew members pretty well by just being parked next to the #4 team in the pit area. The #50 ride is one of the most coveted seats on the Mod Tour. 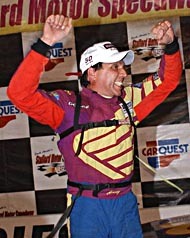 Marquis won twice in 2004. Whoever wins the 2005 NASCAR Whelen Modified Tour championship will have to work for it, and winning races never hurts either. The NASCAR Whelen Modified Tour season will kick off on April 10th at Thompson. 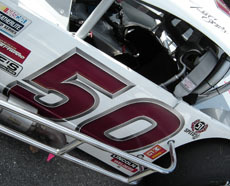 Speed51.com will be on hand and have extensive coverage of The Icebreaker, so stay tuned.